Its been darn right cold here in CO, the kind of cold that burns your face. So we were on the way out one day and Caleb and I were on the "hunt" for icicle hanging from peoples homes and signs etc. We seen the LARGEST one EVER, on a neighbors shed. Just hanging there all huge and beast like, so we snagged it up. Stopped the car and his dad got out and clipped it off and handed it over. what do you think? big huh? this thing makes me laugh. Well that and my sons face below ha! Hey! You have amazing blog! I'm your reader and it's always interesting for me to read your posts! I'll be glad if you follow me back! 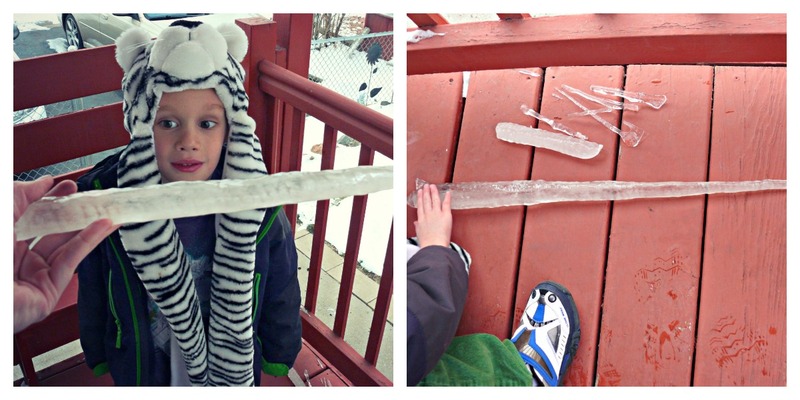 That is one giant icicle....love the amazement on your little guys face...so cute. wow! that is giant!! love your son's face!! cute. ps thanks for sharing at the Inspiration Gallery!